\ Casio India is pleased to announce an all-new and exclusive G-SHOCK collaboration. This year, in celebration of G-SHOCK’s 35th anniversary, the brand collaborates with the planet’s Most Successful Virtual Act*, Gorillaz. The partnership brings together two world-class, innovative and renowned entities to offer a classic style redefined once again. 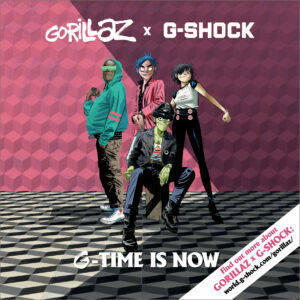 The collaboration sees Gorillaz help G-SHOCK creator Mr. Ibe realise a lifelong dream, hatching a plan to reach their mutually aligned intergalactic goals. The collection will focus on G-SHOCK’s original 5600 case shape, the first ever G-SHOCK watch designed by engineer and founder Mr. Ibe 35 years ago. G-SHOCK’s longest selling model, the 5600 revolutionized personal timekeeping and has remained a favorite the world over.